There’s no way to sugarcoat this, so let’s just get right down to it: The month of April is upon us. No need to double-check either. Trust us, we already did. 25% of this year is already in the books. For many Americans, this isn’t exactly welcome news. On the heels of being magically robbed of an hour of sleep by Daylight Saving Time hocus pocus, April marks the start of a rather miserable double-whammy: allergy season and tax season. This may be why the great T.S. Eliot kicked off “The Waste Land,” perhaps his most famous poem, by declaring that “April is the cruelest month.” Despite this, folks in the construction, manufacturing, and fabrication industries actively welcome the arrival of April with open arms. Why? Because April is National Welding Month! What is National Welding Month? For the uninitiated, National Welding Month is a time to make an impact on the industry through recognition, education, and service. This month, the focus should be on acknowledging the achievements of our industry tradespeople, teaching others about the importance of welding in our society, and taking steps to introduce welding into our schools and communities. These efforts are crucial, because as ubiquitous as our industry is, it still manages to fly under the radar of the general populace. The average person simply isn’t aware of just how much their life is affected by welding. Every day, in shipyards, factories, assembly plants, and construction sites all over the country, skilled workers build the structures and products that improve our lives and drive our economy. Most people tend to underestimate the skill and technical acuity that the welding profession demands, and generally fail to consider the career options that it can offer. This disconnect is perhaps part of the reason why there is a massive shortage of skilled welding professionals in this country. According to several industry estimates, the welder deficit is set to eclipse 200,000 by 2020, and hit nearly 375,000 by 2026. That’s no less true today than it was twenty-two years ago. In fact, the “secret” part of that phrase is perhaps more pronounced now than ever. In celebrating National Welding Month, the goal is to broaden the reach of the welding community and let everyone in on the secret. If you’ll indulge us for a moment, picture the following: You’re really excited about a movie premiering next week, and you’d love for a bunch of your friends to go and see it with you. The only problem is, they don’t know anything about the movie. In fact, they haven’t even heard of it. If you don’t invite them, tell them a little bit about it, and express how passionate you are about it, you can be sure you’ll be watching that movie alone. 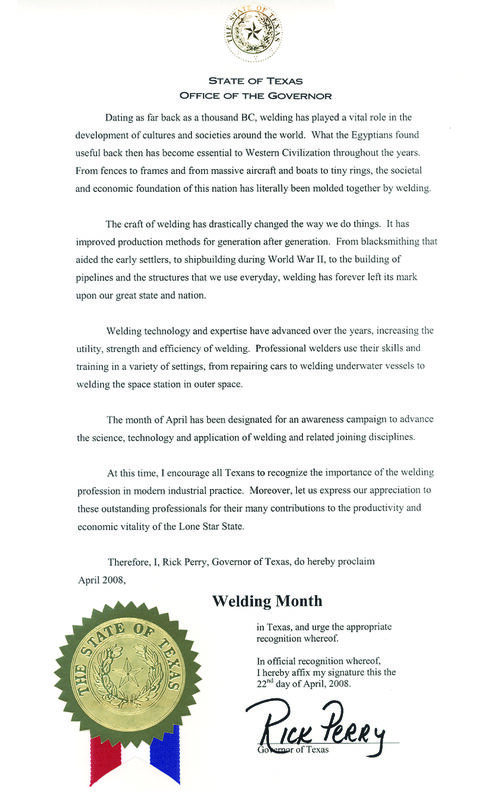 As an industry, we have to approach National Welding Month the same way. If we want our communities to join the party, we need to let them know there is a reason to celebrate. Here at AWS Headquarters, we’re excited to kick off National Welding Month on the right foot. Whether you’re a tradesperson, an educator, a business owner, a student, or simply a curious passerby, we’ve got you covered. For the occasion, we put together a listing of resources to get you started on our National Welding Month landing page. Also, we’ll be offering up blogs, ideas, and special offers to keep you in the spirit throughout the month of April. The NWM page is chock-full of useful information, so we encourage you to really dive in and see what speaks to you. If you’re not sure what the first step is, don’t worry. Since it’s not our first rodeo, we have a few basic suggestions on how you can get started. Everyone loves an interesting fact. Passing one along might just pique the interest of a friend looking to learn something new, a girl scout, or a local teen who isn’t sure if college is for them. Did you know that the history of welding dates back several thousand years? Hey, welding isn’t just done in one way. There are actually over 80 distinct welding processes. Have you ever seen Cloud Gate? 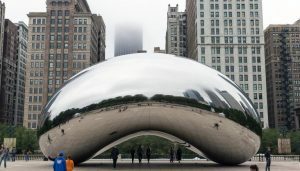 That giant metallic bean at Millennium Park in Chicago? Well, despite its perfectly smooth exterior, it’s actually comprised of numerous welded plates. In fact, special equipment needed to be invented for the project. You can add a personal touch by using facts or stories from your own experiences in the industry. You’ll find that simply chatting with someone who knows nothing of welding can teach them something new and improve their attitude toward the field. If you want to take things to the next level, consider speaking at a local school’s career day. This is a great way to pique the interest of youngsters who are just beginning to discover what they’re passionate about. The best way to feel good about the future of our industry is to ensure that it’s being left in capable hands. While there are countless resources available to those just getting started in the industry, none is as valuable as the guidance and wisdom imparted by someone who has been there and done that. That’s where you come in. This month is a great time to reach out to a welding student or newcomer at your company and take an active role in their development. Take a fresh-faced novice under your wings and showing them the ropes. Go ahead, show them your special techniques and let them know you’re always up for talking shop and answering questions. Support them when things don’t go right, while challenging them to continue improving. 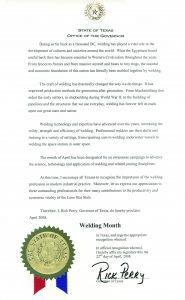 A faxed request was all that was needed to have the Governor of Texas declare April “Welding Month” in 2008. If you want to truly impact and promote the industry in a substantive way, you may have to set an example for others to follow. The best ways to do this involve being generous with two of our most valuable assets: time and money. Do you know of a local apprenticeship program that could use some help? Make a commitment to give a hand. Is there no local program at all? Buckle down and get one started! Do the kids in your neighborhood need a constructive way to spend their weekends? Sign them up for the Scouts and help them get a merit badge in welding. Do you feel like there isn’t enough support for welding education at the national level? Consider making a financial contribution to a local vocational school or scholarship foundation, or, better yet, get in touch with your elected officials and chime in on how our resources should be allocated. Remember, at its core, National Welding Month is about promoting and celebrating welding and other skilled trades. This is a time to make a positive impact on the industry and have fun doing it! Trust us, you’ll be shocked at how fast the month flies by. If you have an idea on how to celebrate National Welding Month, or want to show us what you’re doing for the occasion, we’d love to hear from you.